Targeted nutritional supplements are an essential part of Dr. Perricone's 3-Tier Approach for a healthy body and beautiful skin. This perfectly dosed daily program of nutrients is specifically designed to help support a healthy immune system and improve cognitive skills while enhancing the look of your skin. Formulated with supplements to support bone and joint function, fight free radical damage and stimulate healthy growth of hair and nails. They also help diminish the appearance of fine lines and wrinkles and give skin a radiant and glowing appearance. A powerful antioxidant that neutralizes free radicals and prevents cellular damage. Improves skin's muscle tone and provides cognitive benefits. Promotes healthy bones and teeth and promotes a healthy sleep pattern. Rich in essential fatty acids, moisturizes skin from the inside out. Take one packet twice daily with meals. Since each component of the program works together, take the full contents of each package. I have to say I'm a total believer in the product. I did a ton of research on it, and even though I read many "planted" reviews -- the same review on a lot of different websites -- I gave it a try.It works. Simple as that.I only take one packet per day because of the cost, and I still got incredible results after about a month. One day, I went to wash my face and just couldn't believe how smooth my skin felt.The result is total-body. My skin looks and feels great, my fingernails are strong, and I haven't been sick since I began my vitamin regime about three months ago.I highly recommend this product! I'd been healthy my whole life until spring of last year, when I came down with symptoms that make my drs think I am getting a connective tissue disease. One of my symptoms has been swelling all over my body- especially my hands, legs and feet. I had tried taking fish oil and other supplements to help with the swelling, but nothing worked. When I read about Dr. Perricone's theory with regards to inflammation and aging, and how these supplements help with inflammation, I decided to give them a try, not really expecting any results. Within 2 days of taking them twice a day, my feet and legs looked normal again. The top of my hands are much less swollen, but i still have the tightness in my fingers. I am only on my 4th day of taking them, but for the first time in a long time, I have hope that maybe all of this can go away, or at least I can control some of the symptoms for now. I'm thrilled!! I will post again with an update after being on them for a longer period of time. 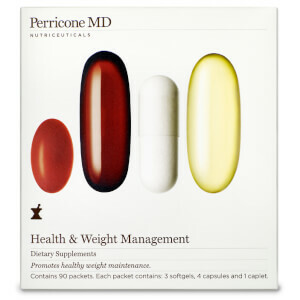 Because Dr. Perricone's products tend to be on the expensive side, I am honestly only taking 1/2 the dosage recommended. It has been a few weeks now and while I cannot honestly say that I see a significant difference in my skin (don't know whether that's because I'm only taking 1/2 the daily recommended amount), but I definitely see and feel a difference in my body. I have received numerous compliments on how I look lately and I do feel more energetic as a whole. Dislike the price, otherwise miraculous result! I saw great results body and skin wise. I am a full time student and I have some concentration issues. I started taking these pills and my concentration level started to improve, I could focus a lot better and my energy level also increased. I was a lot less tired throughout the day and more alert too. I also greatly appreciated that it didn't come with that weird jittery feeling. I was very consistent with taking the pills, at first I took 2 packets a day but I gradually decreased it to 1 packet. Skin wise I noticed a lot less breakout. I know the pills were helping because I wasn't consistent with taking them when I purchased my 2nd box, and whenever I took the pills again I would notice less acne. I didn't notice any improvements on large pores or scarring. I can't think of any bad side effects that I experienced, the only bad part was that sometimes I'd have to take them during class and people would be like omg that's a lot of pills, haha ( not that that bad actually ). Overall if you have my sort of issues I suggest trying out these pills, they worked really well for me. I was taken back by the price of these vitamins; however, after two weeks I feel more energetic, brighter and pleased that I ordered them. There are quite a few to take and so far I only take one packet a day. I'm looking forward to seeing more results in the next months. Thank you Skin Store for your discount as it helps your customers to try new products! These vitamins are hard to digest. Made me sick and nauseated. I saw no benefits after a month of taking these. I wish they worked, but they have not. Makes me feel great! Got rid of age spots! When I first saw these, I thought $140 for supplements? After suffering from acne for longer than I should have and finally finding relief through the Perricone Diet and Skin Clear products and supplements (also Perricone), I decided to try these for my aging skin issues. I was 43 at the time and had lost a bunch of weight, so I had skin sagging, age spots, the beginnings of wrinkles....all sorts of loveliness!After about a week, I noticed the skin on the back of my hands looked different. It didn't look as parched, and well, old. Then after a couple of months, the age spots on the backs of my hands disappearred! Gone!Changes started taking place in my face, too. Wrinkles under my eyes softened, spots lightened, age-related paunchiness that I thought should have disappeared when I lost weight finally did. My face is tighter, skin more toned. It's not so impacted by hormonal issues anymore although I must admit I must follow the lifestyle, too. I used to have "creaky" joints whenever I bent down, but that's gone. It's been about 8 months since I started taking these and I never want to be without them. Anything that helps me to look and feel younger is worth more than this in my book! since taking these vitamins I have not been sick a day! It's been over a year and I've stayed very healthy and I only take one pack a day! I love love love these vitamins!! They are easy to take and my nails, hair and skin have never looked better! I am on my third month and they are worth the $$! !